Marc shares some of the events that happened on this day in history, including the births of Spike Lee and Sister Rosetta Tharpe and the suicide of Ota Benga. That’s a scene from the Spike Lee film School Daze. This is the birthday of Spike Lee born in 1957: Spike Lee was and is a groundbreaking filmmaker. His first full featured films in the 1980’s,, She’s Gotta Have It, School Days and Do The RIght Thing broke down the door to open the way for Black creative talent in Hollywood along with his masterpiece Malcolm – Happy Birthday Spike. 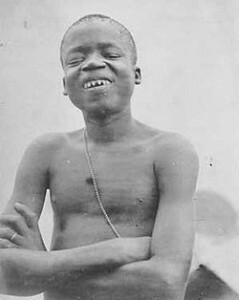 Ota Benga was a Mbuti man from the Congo. While he was out hunting his family was killed by the Belgians trying force people into slave labor, he was captured, sold into slavery and in 1904 an American took him to the world’s fair to be put on display as a non evolved species and later to live in a monkey house in a zoo. On this day in 1916 Ota Benga far from his home found a gun and, committed suicide. Dr. Ralph Bunche receives the Nobel Peace Prize in 1950 for his work as a United Nations mediator for bringing about an end to hostilities between Israelis and Arabs & Palestinians after the 1948 war, that on side called a War of Liberation and the other Nakba or Catastrophe. Ralph Bunche was the first African American to be so honored. Today in 1850 is also the day that Harriet Beecher Stowe’s Uncle Tom’s Cabin was published, heralded by many abolitionists, it sold over 300,000 copies in it’s first printing and is credited with turning minds of many Americans over the issue of slavery, however in response to Uncle Tom’s Cabin, Martin Delany wrote a serial novel about a wandering insurrectionist called Huts in America in response to her portrayal of slavery and Black people that many now see as the most accurate fictional account of slave life. Here’s a song to think about on March 20th. It’s by a musician who’s been called the Godmother of Rock and Roll. She was a pioneer of the electric guitar and played an innovative blend of gospel and blues. The track we’re hearing now was recorded in 1945 and was the first gospel song to cross over to the pop music crowd, hitting number two on Billboard’s “race records” chart, which was later known as the r&b chart. The song is Strange Things Happen Every Day, and the artist is Sister Rosetta Tharpe, who was born one hundred years ago today.